Join us for our annual celebration of Scotland’s National Bard, Robbie Burns! 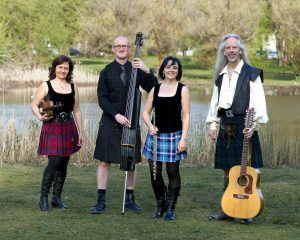 Fiddler and faculty member Rosie Carver with Celtic band Blackthorn and a special guest piper feature the musical traditions of Scotland with a special focus on Burns’ songs and poems. Heart-wrenching airs and ballads, songs with rousing choruses and lively jigs and reels are brought to life with Blackthorn’s luscious harmonies and complex instrumentation. The musical celebrations start at 7:00pm or come early at 5:30pm and enjoy a small plates buffet featuring a cornucopia of Scottish-inspired delights. A piping-in of the Haggis, followed by a recitation of Burns’ Address to a Haggis, round out the long-standing traditions that are a must at any Robbie Burn’s birthday celebration. Haggis will be served at intermission for those who feel inclined to indulge in such fine Scottish fare! All are welcome to stay on after the concert for a meet, greet and sip with the band. Cash bar serving soft drinks, beer, wine and scotch; complimentary tea and coffee.